Not sure what to see in Seattle? 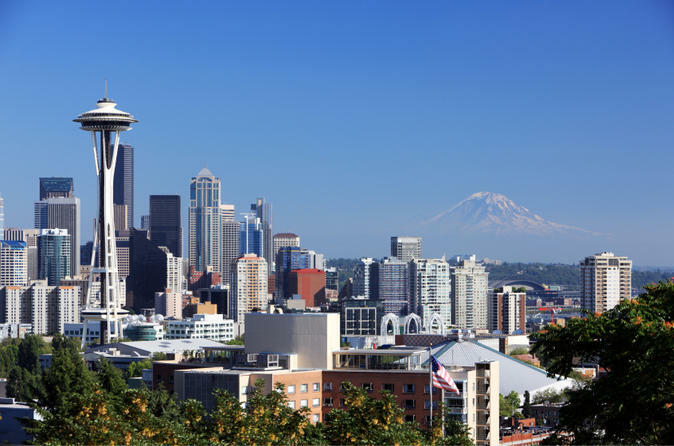 Take the stress out of sightseeing on this 6-hour tour, which covers 50 miles (80 kilometers) of downtown Seattle and the city’s beautiful surrounding neighborhoods. You’ll stop for one hour at the Space Needle (admission included) and enjoy two hours of free time at Pike Place Market. Plus, see dozens of other places that make Seattle special – the Ballard Locks, Safeco Field, Fremont, Chinatown and much more! Keep your eyes open for some of Seattle’s famous views too, including those of the Cascades, Mt Rainier and Puget Sound. The Seattle in One Day sightseeing tour covers the absolute best of Seattle in just six hours. Take a picture of Mt Rainier towering over the Seattle skyline, watch out for flying fish at Pike Place Market and marvel at the 360-degree view from the top of the Space Needle. See the sights that make Seattle so special, not to mention beautiful – the Ballard Locks, Pioneer Square, Puget Sound, Mercer Island and Lake Washington. As your air-conditioned mini-coach takes you around the city with no more than 21 other passengers, your knowledgeable and friendly guide will provide commentary about the city and its local neighborhoods. You’ll have one hour at the Space Needle (admission included) to admire the views and two hours of free time at Pike Place Market to browse the wares and fares, from fish to local treats to jewelry and much more. By the end of this sightseeing tour, you will have a solid knowledge of the Emerald City and a list of fantastic places to explore further during the rest of your trip!